I cashed in $644 for March 2017. The goal of this portfolio is income growth and March was another month showing growth in my passive income. All dividends were reinvested back into the stocks that paid them. My estimates for now indicate that in April I will be able to get $820 and for May I'm planning on getting $350. That looks like a good month YD. You have a lot of good companies paying you dividends. Keep up the good work and thanks for sharing. Great job for the month of March. So far, it looks like we have many happy bloggers reporting their numbers. Nice to see many names in common paying us both. Keep it up! Very nice, that graph is just proof of what we all try to achieve. It looks very nice and increasing slowly, can't ask for more than that. Congratulations. You are increasing your income each and every month and you were up quite a bit from last March. Please keep the hustle going hard! Great results. 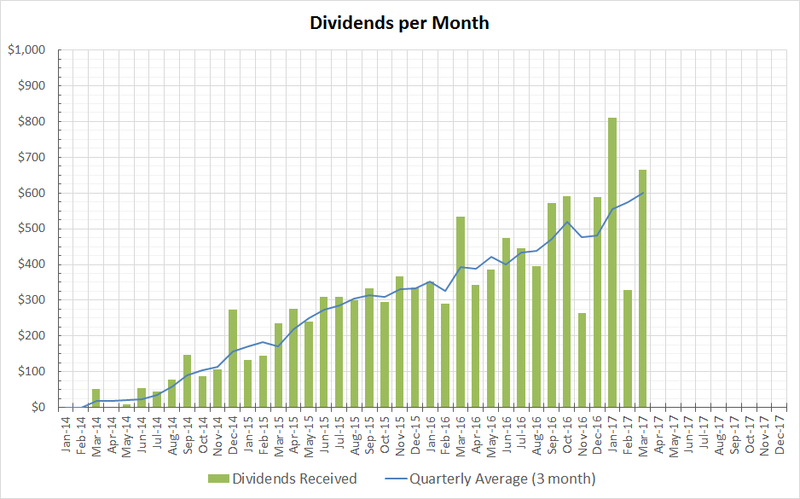 March is always a fantastic month for dividend income. I'm happy to see that you had a great month too.